An exploratory blog to discover mobile blogging. Team 4 from 3rd Billericay, Orion Troop before they set off on the District Night Hike. 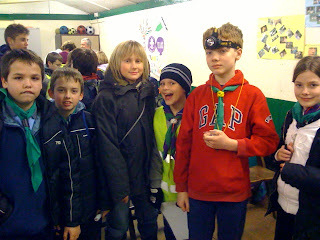 The scouts were issued with local maps and a route card, which they subsequently used to plot the route. The route took us from Runwell Scout HQ, to the village of Ramsden Heath, passing through Downham before heading back to the HQ at just after 11:00pm. Being a clear night, we were able to use the stars to navigate for much of the hike, using the compass only to find footpaths which weren't easily identifiable. Here are the results from the District Night Hike. 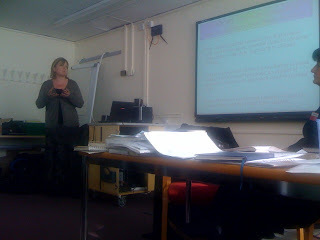 The course today focussed teachers on developing Guided Writing opportunities as part of the Primary Framework. As we know, the Primary Framework builds on much of the work already done in the National Literacy Strategy, so we spent some of the day looking at some of the refinements. The highlight was a presentation given by a Leading Teacher, Emma from Earls Colne, who demonstrated how Guided Writing was being run and developed in her own classroom. There were several aspects which I noted and will develop in my own classroom practice. I was impressed to see how Emma had encouraged peer review and assessment of each others' work something which I do on a regular basis as an oral exercise. However, Emma had the pupils annotating and highlighting examples where pupils had met the success criteria. The children's books were 'alive' with comments and highlights, each one suggesting either success or areas for development / improvement. We watched a clip from the Primary Framework of a class teacher sharing the Success Criteria on large sheets of paper around the room meaning that the children are able to access and refer to these throughout. In addition to these, there were also the indicators of success, like a checklist of things that needed to have been met to reach success. Something that stuck in my mind from the course today is the shift from teachers controlling the learning to enabling learners to drive it forward for themselves. High quality teaching is now about providing the pupils with 'pathways' through their learning. Jonathan is passionate about the use of technology in education. He is also rather busy as a Scout Leader, gardening enthusiast and sailboat racing with a team on Cracker, an IMX40 yacht. Jonathan has now taken up a new position at Kings Road Primary School as ICT co-ordinator and senior teacher after a very successful time building a new school in Hindhead, called Stepping Stones. Jonathan wants to use his experience and knowledge in building successful learning communities to the mainstream environment through the use of technology. Jonathan often presents some of his thinking and experiences here on this site.